June 25 is National Strawberry Parfait Day. Ice cream layered with chocolate and biscuit is always good, but strawberry parfait is perfect for hot summer days. French-styled dessert has got many varieties. Traditional French parfait is made with a custard-base ice cream, that was well whipped to achieve an airy texture. Then ice cream is layered with fruit puree and served in special parfait glasses, that are long and tapered. American parfait differs from French sundae. This version of dessert consists of layered parfait cream, ice cream and gelatin and topped with whipped cream, liquor or cut fruit. 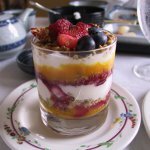 Yogurt, nuts and granola sometimes can substitute some classical layers of parfait and even all of them. Celebrate National Strawberry Parfait Day with a glass of perfect ice cream and cream, layered with fresh strawberries. Dissolve two packages of strawberry Jello in two cups of boiling water, add 1 package of dissolved in 1/2 cup cold water gelatin. Cut in strawberry ice cream and mix until ice cream is melted. Add 3 drops of red food coloring and refrigerate mixture for 15 minutes. Remove from fridge and fold in sliced strawberries. Serve strawberry parfait immediately.